Propaganda can be found throughout history. It has been used to convince a population to convert to a new religion, to introduce proper hygiene and waste disposal techniques to urban populations, and to encourage citizens to report criminal activity and sign up for elections or a census. It has also been used to convince a nation that a race of people is inferior and the cause of all that country’s problems. It has been used to recruit soldiers to join the armed forces. It has been used to discourage an opposing force via radio broadcast. And if you’ve braved the 24-hour cable news in the past ten years, it’s been used to convince deep red AND deep blue voters that their side is completely right and the other side is out for nothing more than the complete and utter destruction of the American way of life via a mix of ruthless, calculated intelligence and complete and utter idiocy. 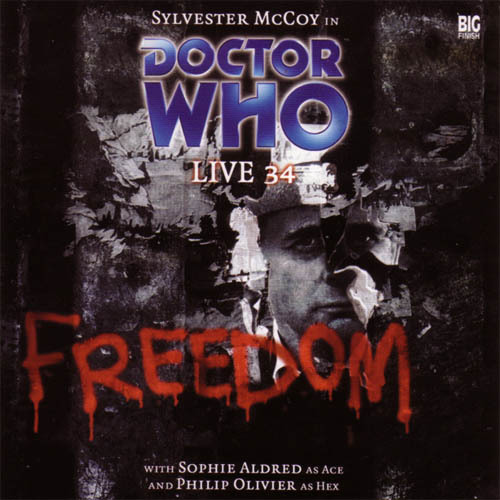 LIVE 34 is an experimental audio from Big Finish. Instead of experiencing the Doctor’s adventures first hand, listeners are instead treated to a news program that presents the exploits of the Doctor and his companions in a series of live reports and exclusive interviews, all under the watchful eyes of the colony’s regime. It’s a very unique narrative device that will deeply appeal to some listeners as it gives a “bad guy’s view” of the Doctor’s actions. Other listeners, though, might be turned off by the fact that they’re listening to two straight hours worth of news programming that glosses over the Doctor’s off-screen actions. All listened, though, should be disappointed by the “huge reveal” that comes completely out of left field, which may lead to mixed feelings about the story’s sudden conclusion. In the summer of 2003, Big Finish threw open their doors and held an open submission period, where any could send an audio script to the company for possible production and broadcast. Over 650 scripts were submitted during that period. In the end, what attracted Gary Russell to the script by James Parsons and Andrew Stirling-Brown (the pair also contributed a story, Purity, for the I, Davros range) for LIVE 34 wasn’t the standard tale of “the Doctor overthrows a corrupt regime,” but how the story was delivered. Four half-hour (roughly) news programs from Channel LIVE 34 covers the events of sixteen days with a mix of straight forward “news of the day” delivery and two in-depth reports by two separate reporters. The “news of the day” deliver contains live reports and recorded words as well, all containing the standards dialogue, clichés, and situations that go along with being the mouthpiece for a totalitarian government such as “with a heavy heart” and “they threaten our liberty” and “iron-clad evidence.” The script by Parsons and Stirling-Brown also goes a long way in establishing the setting without resorting to direct exposition, with phrases such as “since the colony was founded over a century ago” and “bombings in Second and Third City.” Using a news program at the only narrative source, however, does have its drawbacks, however, which I’ll go into a bit later on. Sylvester McCoy can monologue and grandstand with the best of them, and when interviewed by talking head Drew Shanan during the first episode, the Seventh Doctor shows his strength at verbal wordplay, turning the conversation around with careful words and outright ignoring the most obscene factors. We get hints of his anger, some coy responses to past events, hints to future events, and even a little humor when he dryly grouses that “someone doesn’t know when to wait to start causing explosions.” But as the Doctor becomes the candidate for the Freedom and Democracy Party, standing in a fresh election against Premier Jaeger, he steps into the background for episodes two and three. This is a good thing, not only because it gives Ace and Hex more screentime for their episodes, but the Doctor isn’t mean to be the spokesperson/politician type. If anything, the Seventh Doctor is more of a “hatchet man” who does the things that need to be done behind the scenes…and since the listeners doesn’t get to see his behind the scenes exploits this time out, it’s hard to put McCoy’s performance in the proper context. The Doctor gets his moment at the end when he holds sway over a hostile Premier, his security forces, and an angry, cheering mob…but without knowing the full details about the events that led up to that moment, it all feels very deus ex machina. McCoy’s grand, but the Doctor that we see in LIVE 34 just doesn’t seem to match up with all that listeners know about him. Long time Doctor Who fans won’t be surprised to find out that none other than Dorothy “Ace” McShane is the Rebel Queen (a name she didn’t pick for herself), the “rabbling rousing terrorist” responsible for a string of bombings across Colony 34. Aldred’s job in the second episode, as she submits to an interview with reporter Ryan Wareing deep in the slums just outside the walls of First City, is to provide the exposition as to how she came to Colony 34 (on a bit of R&R, she came across a political refugee, aided him in breaking his family out of a nearby camp, one thing led to another…). Aldred does a great job as being a bit older and a bit wiser as to how the world works, with admitting the bombings her group did that didn’t kill anyone, and how the government has been framing her by blowing up occupied buildings. But she’s still young enough to maintain that streak of anger against authority that viewers saw during her time on television, that sometimes she feels there’s no problem a little Nitro-9 won’t fix. Hex is definitely the “new guy” in the TARDIS in LIVE 34, AND Philip Olivier mixes “bewildered” with “quickly grasps the situation” very nicely. It’s refreshing to see a companion who, after a few adventures under his belt, still holds onto the “what the HELL have I gotten myself into” mentality. Olivier has revitalized the Seven/Ace dynamic, but here he’s on his own in the third episode, working undercover as an EMT-type being followed by reporter Charlotte Singh for an “over the shoulder” report about emergency workers. We get a little bit of background on Hex’s parents, specifically his Dad, and how his Dad steered him towards medical work. Just two minutes or so of backstory has me more emotionally invested in Hex than over a half of dozen audios featuring C’rizz! Hex gets a phone call about a lady who hurt her leg in a minor spill, but it turns out that the torrential rains opened a sinkhole under her house…and Hex realizes the sinkhole is actually a mass grave full of skeletons, and that the Doctor called it in so the reporter could show it live on television. It’s definitely in the vein of the Doctor not revealing his plans to his companions, but props to Hex (and Olivier) for realizing the situation for what it was very quickly. Olivier also gets points for when he’s gently prodded by the Doctor to give part of the big exposition dump in front of a public square filled with people, and he hesitantly works his way through the speech. It shows the Seventh Doctor is still a “Professor” of sorts and that Hex hasn’t magically become an amazing, perfect companion after only a few TARDIS trips. While living in mid-00’s America wasn’t a police state (and anyone who tells you otherwise needs to lighten up or be shown what happens in an actual police state), Premier Jaeger could have walked right out of the more shadowy portions of the Bush Administration with his talk of “utmost regret,” “iron clad enemies,” and “justice delivered swiftly.” William Hoyland is a veteran actor of British television, along with roles in the movies Gandhi and For Your Eyes Only, and he hits every single note that a “dictator in all but name” needs to hit. He doesn’t go full V for Vendetta and chew the scenery until the very end of the story, instead coming off as a leader who is trying, with the heaviest of hearts, to do the “right thing” for “the greater good” against “those who would strike a blow at our way of life,” which “measures taken with the utmost regret.” It’s incredibly chilling and gives listeners an insight into the slippery slope of a colony willing to trade liberty for security, with Hoyland’s Jaeger at the helm. News announcer Drew Shanan delivers everything as a stereotypical newscaster would – straight forward, right off the teleprompter, with complete and utter sincerity, even to the point that a mention of his broadcast colleague mysteriously committing suicide (probably from shooting himself in the back of the head. Twice) is played off as nothing more than the normal course of events and barely warrants a mention at the end of another story. Andrew Collins was a great choice to play Shanan, as he’s a well-respected pop culture for the UK paper The Guardian and would go on to appear on over a dozen episodes of Doctor Who Confidential. This is Duncan Wisbey’s first role with Big Finish, as the doomed reporter Ryan Wareing who dares to broadcast a quasi-accurate sympathetic Rebel Queen, and he does a good job as an intrepid reporter looking for the story. The same goes for Hex’s reporter companion Charlotte Singh as played by Zehra Naqvi, who realizes the danger of their situation and manages to survive by calling for an end to the broadcast, only to step up at the end of the story when the real news begins to happen. On one hand, for an audio that’s supposed to be a news broadcast, LIVE 34 succeeds admirably. Points to director Gary Russell and the post-production crew led by David Darlington for making LIVE 34 sound like an actual news broadcast, with theme music, quick cuts, static, archive footage sounding slightly seasoned with static. As a Doctor Who story, the narrative structure doesn’t quite work. In many ways, LIVE 34 is a counterpart to televised serial The Happiness Patrol. In that story, we follow the Seventh Doctor as he topples a dictatorship where citizen happiness is mandatory. In LIVE 34, we follow the dictatorship as the Doctor topples it from behind the scenes. This means, in the long run, this story simply has too many holes in the narrative. Ace fills in some of the gaps in the second episode, but there’s still so many big questions. How did the Doctor becoming a political nominee? How did he take control of the FDP? Why were the people in the mass grave Hex found shot? How did the Doctor convince the Central Committee to declare the election null and void…actually, how did he convince them to allow an election in the first place? LIVE 34 embraces the concept of “tell don’t show” as its main narrative device, and while it works very well on that note, there’s always this sense, just beyond the horizon of needing to know more. It’s not quite a case of “events happen to solely to move the plot along,” but considering LIVE 34 takes place over sixteen days in a little less than two real-time hours, I wish there would have been a little more exposition, or maybe “hidden recordings dropped off at our news agency’s doorstep,” to fill in those gaps. Nowhere is this more apparent than the big reveal…that Premier Jaeger isn’t really Premier Jaeger! Rather, he’s someone who looked enough like him that a little plastic surgery allowed him to act in Jaeger’s stead when the original Premier came down with a disease that caused horrible facial scarring. Over time, the “double” took power and locked the “original” away, keeping him alive solely for biometrics and DNA samples. The other reveal, that the dead bodies of the poor are being burned for fuel to avert a power shortage, had its seeds planted throughout the story and comes as a shock, not a surprise, to the listener. The twin dilemma, though, comes out of right field with the barest of hints – a body bag delivered to the hospital while Hex is there that suggested to the Doctor that he should do a little snooping. This is where the flaws of LIVE 34 come through – a normal story would have followed the Doctor trying to recover the body bag and find out the truth of the matter, but instead the Doctor (and Hex, with his prodding) give a huge exposition-laden speech that explains the whole matter. While it makes sense in terms of a news broadcast, the listener feels cheated, like if the murderer in an Agatha Christie novel was introduced and revealed in the last five pages after never being mentioned once before in the story. I applaud LIVE 34 for doing something different. Big Finish had stretched the audio format to its utmost before and will continue to do so in future releases. This story is definitely worth a listen for its novelty, but the news broadcasts cut out the most interesting parts of the story – the actual actions of the Doctor and his companions. Having those actions explained to us by a talking head makes the story feel at empty as this regime’s words. Next up – Millennia ago, the people of the planet Caludaar pledged never to set foot on their sister planet Endarra. But what secrets does the planet hold? This entry was posted in Big Finish Review and tagged 3/5, Ace, Big Finish, Big Finish Audio, Big Finish Review, Doctor Who, Doctor Who Audio, Doctor Who Review, Hex, Philip Olivier, Seventh Doctor, Sophie Aldred, Sylvester McCoy, TARDIS. Bookmark the permalink.